As mentioned in a previous review, I have been a big fan of arepas since I first laid fork on the sweet corn and cheese stuffed version as a kid. 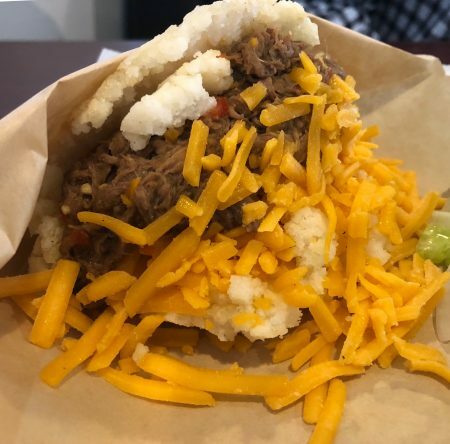 My first experience with white corn arepas, overflowing with meat, etc., was Arepa Mia in Atlanta (check it out if you are in the area!) and my love of arepas has only grown since. I was excited to find another option for this South American delight opened in the Brooklyn area of Jacksonville and decided I would meet my husband for lunch to check it out. Since I tend to live meal to meal, I visited the website before lunch. 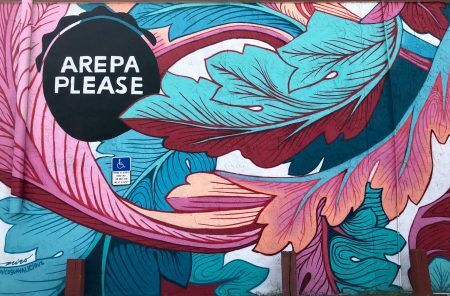 I was surprised to find out that Arepa Please has menu items ranging from arepas to New York-style deli sandwiches and couldn’t wait to visit. There was a decent crowd in the restaurant, but the food seemed to be coming out quickly, which is important when you only have an hour break. 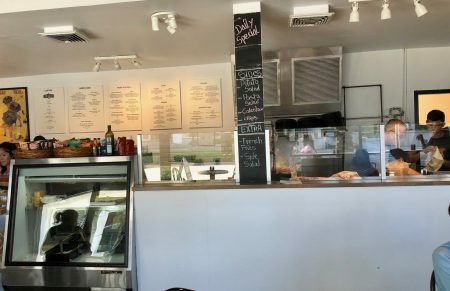 We walked in to place our order at the counter, and immediately noticed the staff working hard to prepare the sandwiches right in front of us. There looked like a good mix of deli and arepas being eaten around the restaurant, but we opted for a couple of the arepa options. We ordered the Queen ($8.50), a Venezuelan classic with shredded chicken, housemade avocado mayo, cilantro, and avocado, and the Jax Blond ($8.95), which is filled with shredded beef and cheddar cheese. The website didn’t mention any sides, but there were a few to choose from. 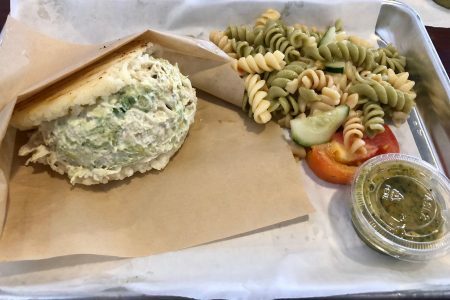 Each arepa came with one, so we chose a side salad and pasta salad. The Queen was a surprise when it arrived since I didn’t expect it to be chicken salad from the menu description. After the first bite, I was not upset with my decision. There was enough chicken salad on the sandwich to fill 2 arepas easily! The actual arepa was thick, allowing the inside to stay soft and flakey while the outside was nice and crispy. The filling was creamy, with big chunks of avocado running through the tender chicken. The pasta salad was a bit plain; I saw some orders of potato salad going around the restaurant and think I may opt for that next visit. The star of our meal was the Jax Blond. The meat was juicy and the pomodoro sauce was well seasoned. Their housemade garlic and herb sauce was a star on both arepas- make sure to ask for extra! Although we didn’t get a deli sandwich, I did spy on other people’s orders. I saw a cheesesteak ($8.75) that could feed more than one person, oozing melted provolone. Another patron ordered an Italian sandwich ($7.95) that could barely be contained by the tray it was served on. The gyro wrap ($7.95) seemed to be a popular choice around the restaurant as well. We finished our meal with café con leche ($3.25), hoping the caffeine would push us through the afternoon. 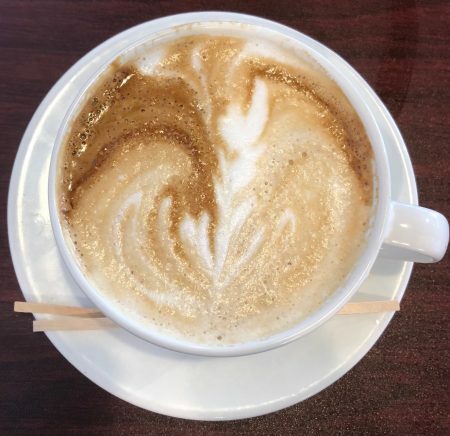 The coffee came out fresh, steaming hot, and looked beautiful. I also appreciated that they use coffee from another local establishment, Bold Bean. This restaurant is a good addition to the area. By offering a variety of flavors, from arepas to turkey sandwiches, they can please both the adventurous and the picky eater. Tagged american, arepas, Casual, coffee, International, Latin American, lunch, quick service, Take Out, Takeout Available. Bookmark the permalink. It is good. A bit pricy though. From what we can tell there’s not much beyond maybe a salad.